This online edition of the printing book started with the same content as the printed and ebook versions, but then it took it to the next level. The book will reformat itself for different sized screens. You can edit the code in a live editor. And the book will work offline. HTML5 is here, and with it, web applications have acquired power, ease, scalability, and responsiveness like never before. 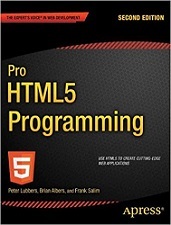 With this book, developers will learn how to use the latest cutting-edge HTML5 web technology - available in the most recent versions of modern browsers - to build web applications with unparalleled functionality, speed, and responsiveness. This edition includes major revisions for WebSockets functionality, reflecting the new W3C specification. It also features new chapters covering the drag-and-drop API as well as SVG. Peter Lubbers is the director of documentation and training at Kaazing Corporation and the co-founder of the San Francisco HTML5 User Group. Peter also teaches HTML5 training courses all over the world. Prior to joining Kaazing, Peter worked as an information architect at Oracle, where he wrote many books, including the award-winning Oracle Application Server Portal Configuration Guide. At Oracle, Peter also developed documentation automation solutions, and two of his inventions are patented. A native of the Netherlands, Peter served as a Special Forces commando in the Royal Dutch Green Berets. Peter lives on the edge of the Tahoe National Forest and in his spare time, he loves to run ultra marathons in the Sierra Nevada foothills and around Lake Tahoe (preferably in one go! ).